I’ve been using Facebook Ads for a little less than a year now. And contrary to my initial thoughts and most of the posts I’ve read about them, they have worked out pretty good for me and my clients. Just to be clear, it has nowhere near the scale or robustness of Google Adwords, but it does provide some opportunities Adwords does not. So with that said, I figured I’d write a quick rundown of how Facebook ads work, how to set them up and what tracking and optimization features they offer. The place to start your Facebook campaign research is Facebook Lexicon Keyword Tool. It allows you to see the trends for different words and phrases on Facebook Walls. The data is calculated by counting the number of occurrences or posts for every keyword (ex: “vampires”) across profiles, groups and events on Walls every day. All personal information is removed so there is no way to track data back to a specific person. You can use Lexicon to identify new trending keywords or topics to target with your Facebook campaign. You don’t have to be a Google Adwords Expert! Setting up a Facebook campaign is fairly cut and dry once you understand the key elements that make up Facebook Ads (Ads & Creative, Targeting, Bids & Budgets, Analytics & Optimization). Although each part of the campaign is important, I cannot stress enough how important it is to test targeting segments, creative and landing pages. If you don’t test, your campaign is pretty much doomed from the get go. So test, test, test. At the moment Facebook is offering multiple marketing platforms: Facebook Pages, Facebook Applications, Facebook Connect, Facebook Events, Traditional Facebook Ads, Facebook Social Ads or Engagement Ads. I am only going into Facebook Ads and a little into Facebook Social Ads on this post. 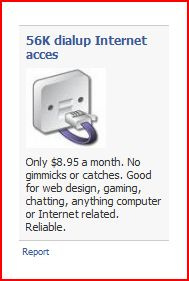 Facebook Ads accepts 2 types of ads, a Facebook Ad and a Social Ad. The Facebook Ad is a straight forward branded ad, linking to either an external site, a Facebook application or a Facebook Page. Here are the 3 types of Social Ads explained by Jeremiah Owyang much better than I can. For smaller to midsized companies without a large enough existing brand following, I suggest staying with the standard Facebook ads in the beginning. You can start by using Facebook ads to build up a larger share of voice and transition over to Social Ads once you have grown your number of followers on your Facebook Page. You can decrease the amount of time this takes substantially by incorporating Facebook Connect on your sites, to encourage and make it very easy for your visitors that are Facebook users to connect with your Facebook Page and share content with their Facebook friends. When executed properly the exponential effect is huge! In fact you can also kick start your efforts by design a Facebook Ads campaigns specifically targeted to generate brand awareness and grow your company Facebook Page fans via ads and Facebook connect. Once you can develop a good number of Fans on the company Facebook Page, you can begin using Social actions on a much larger scale. “Social actions” are the “Golden Egg” of Facebook Ads. Once you get Social Actions going, your likelihood of your message going viral increases dramatically. Your ads will begin appearing on the Walls and Mini Feeds of your Fans Friends. The more Fans you have, the farther your message travels within the Facebook network. The more users interact with your Facebook Page and Ads, the more you come out on their friends Walls. It’s that simple. Don’t go overboard when developing the creative. Use simple and clear copy with a attention grabbing titles. That doesn’t mean to write an irrelevant or false title like a lot of the Facebook Ads I’ve seen, just one that sticks out. Your titles are limited to 25 characters and 135 characters for the body. So don’t try and cram every service or product you offer on the ad, leave some content for your landing pages. Create multiple versions of each ad with different images if possible so you can do some A/B tests. Always use an image on your ads. The images should be 110 x 80 pixels and less than 5 megabytes. If the image is larger or smaller than 110 x 80 Facebook will resize it automatically, so don’t stress it too much! They do not accept animated or flash images. Facebook has fairly robust targeting options compared to Adwords. They allow you to target by State, City, Gender, Age, Keywords, Workplaces, Relationship and Sexual Persuasion. According to Facebook, there are 33,849,820 targetable persons in its network. 14,350,900 Men and 18,548,300 Women in the US. Facebook determines geo targeting via user IP, NOT their geographic network on Facebook. A very useful feature is the ability to target by specific workplaces or universities. Although you can target to High School students via the age targeting, you CANNOT through school networks. When setting up targeting make sure to only select areas serviceable by your business. When selecting keywords to target use Facebook lexicon to see estimates and find keywords. Step out of the box and try and identify new relevant keywords. Facebook allows you to set daily budgets at the campaign level, starting with a minimum of $5 per campaign or 2X your Minimum CPC/CPM. The current minimum CPC is $0.01 and the minimum CPM is $0.15. But don’t expect to start with a $5 campaign at $.01 CPC, it won’t work! I started my first tests with $250, I suggest you start with at least that much. I say this because with less than that, I doubt you will be able to gather enough actionable data to make educated decisions on creative, landing page optimization and testing. Facebook assigns an internal Daily Spend limit of $250 when you start off, which they increase over time depending on your daily spend and after 5 successful payments. Budgets and prices are going to vary based on your targeting options, but don’t be fooled, there are A LOT of impressions on Facebook, so plan accordingly. Make sure you set your targeting right, set the daily budget at what you want to spend, and test from there. For the most part, I would suggest going with CPC model on Facebook. Why you ask? For several reasons: #1 CPM based bidding is dead #2 and more importantly both on my campaigns and other Facebook Ad case Studies I’ve read CPM ended up costing more because of the very low CTR% on Facebook. Once your campaign is set up and running you’re ready to start collecting data. For this, Facebook has Facebook Insights. If you are using a link to an external site you can tag the link and gather data with Google Analytics or any other analytics program. But for this post, I will be focusing on the metrics available via the Facebook Insights. There are 3 main reports I use. 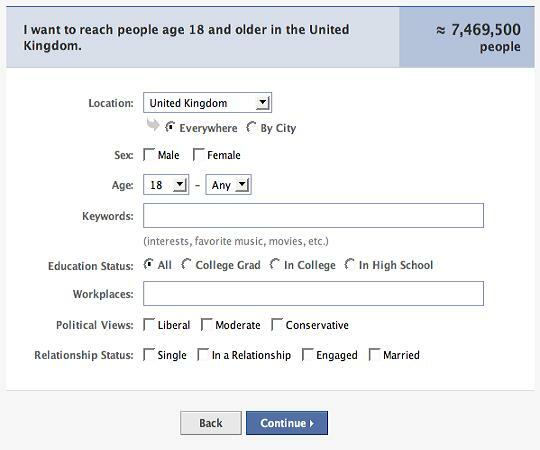 Responder Demographics provides the aggregate age, gender and geographic location of the users who have clicked on your Facebook Ad. Responder Profiles provides psychographic information of these same users, which is aggregated from user profiles and shows common interests, favorite TV shows, movies, books and music. This is a great report to identify new targets by finding new keywords, locations and interests of the users clicking on your Facebook Ad. The Advertising Performance report provides an exportable version of the metrics you see in the interface: impressions, clicks and click-through rates, data by unique user and performance data specific to your ads that contained social actions, if you’re using Facebook Social Ads (see definitions below). 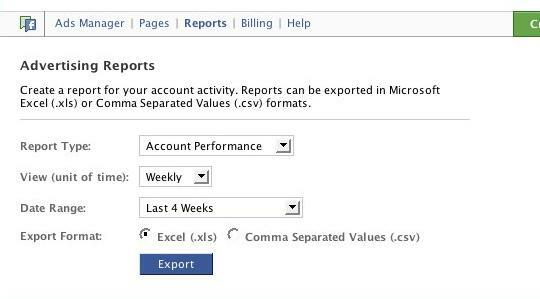 In addition, you can also summarize your report by Account, Campaign or Ad . The Account level report aggregates data across all campaigns, ads and targets, while the Campaign Reports breaks these statistics down to the campaign level, and the Ad reports break them down further to the individual ad level, etc, etc. Within the Facebook Ads system, there are 2 types of promotion of ads, Organic and Paid. Organic promotion refers to News Feed stories generated based on social actions taken by users on your Facebook Page or Facebook App. There is a huge opportunity here to make it go viral, by testing actions and headlines and identify the ones with best distribution rates. Paid promotion refers to Social Ads created specifically to promote traffic to a Facebook Page. Date: The date on which the activity reported in the row of the report took place. Please note that monthly reports will be dated on the first of each month and weekly reports will be dated on the Sunday that marks the beginning of the week. Ad/Campaign Name: The name of the ad/campaign reported in the row. Ad/Campaign ID: The unique ID number of the ad/campaign reported in the row. Total Impressions: The total number of times the ad referenced was shown has been shown on the site. Total Clicks: The total number of clicks on the ads tracked by that row in the report. Total CTR: CTR stands for click through rate. The CTR for an ad is calculated as the number of clicks the ad received divided by the number of impressions (times the ad was shown on the site) in the given time period. Total Average CPC (US$): The average cost per click in US dollars for the given row. Total Average CPM (US$): The average cost per thousand impressions in US dollars for the given row. Total Spent (US$): The total cost in US dollars for the given row. Unique Impressions: The number of people who viewed the ad(s) tracked by the given row of the report. Unique Clicks: The number of people who clicked on the ad(s) tracked by the given row of the report. Unique CTR: The unique click through rate. The unique CTR is calculated as the number of unique clicks the ad(s) received divided by the number of unique ad impressions. Total Social Impressions: The total number of views (impressions) for ads with social actions attached to them for the given row. Not all ads have social actions attached to them. Total Social Clicks: The number of clicks on ads with social actions attached to them for the given row. Not all ads have social actions attached to them. Total Social CTR: The click through rate for ads with social actions attached to them. It is calculated as the number of “social clicks” divided by the total number of “social impressions”. Unique Social Impressions: The number of people who viewed ads with social actions attached to them for the given row of the report. Unique Social Clicks: The number of people who clicked on ads with social actions attached to them for the given row. Unique Social CTR: The unique click through rate for ads with social actions attached to them. It is calculated as the number of “unique social clicks” divided by the number of “unique social impressions”. Thx for such a detailed report on Facebook Ads. Can you help, I ned to set a FB account for my company which neds to be on a generic e-mail address where all staff can access, I will also wish to put adverts on this to generate business, gain profile and visibility etc. Thanks so much for the advice it really helped, Check out Facebook Ads manager If you use facebook advertising alot. It makes everything so simple I can now create 1000 ads In 5 minutes!! Do you know the difference between the ads that appear on the news feed (they always seem to be bigger brands like Starbucks, and more recently, a George Clooney movie) and the ads that only appear when you’re viewing a profile or page? I have only been able to ever advertise next to a profile page, and I’m wondering how to go about advertising on the news feed, or just learning more about it.